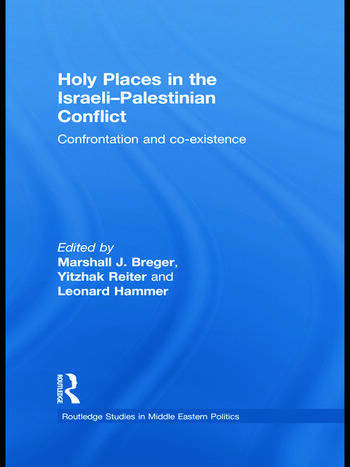 This book addresses the major generators of conflict and toleration at shared holy places in Palestine and Israel. Examining the religious, political and legal issues, the authors show how the holy sites have been a focus of both conflict and cooperation between different communities. Bringing together the views of a diverse group of experts on the region, Holy Places in the Israeli-Palestinian Conflict provides a new and multifaceted approach to holy places, giving an in-depth analysis of relevant issues. Themes covered include legal regulation of holy places; nationalization and reproduction of holy space; sharing and contesting holy places; identity politics; and popular legends of holy sites. Chapters cover in detail how recognition and authorization of a new site come about; the influence of religious belief versus political ideology on the designation of holy places; the centrality of such areas to the surrounding political developments; and how historical background and culture affect the perception of a holy site and relations between conflicting groups. This new approach to the study of holy places and the Israeli-Palestinian conflict has great significance for a variety of disciplines, and will be of great interest in the fields of law, politics, religious studies, anthropology and sociology. Marshall J. Breger is a Professor of Law at the Columbus School of Law, The Catholic University of America where he teaches Administrative Law, Church and State, International Law, and Legal Issues of the Mid East Peace Process. A contributing columnist to Moment magazine, he writes and speaks regularly on both legal issues and issues of Jewish public policy and has published in numerous law reviews and periodicals. Yitzhak Reiter teaches at the Conflict Studies Program of the Hebrew University of Jerusalem and is a senior lecturer at the Department of Political Science of Ashkelon Academic College. Between 1978 and 1986 he served as the Deputy Advisor on Arab Affairs to three Israeli Prime Ministers and is very active in projects of Jewish-Arab dialogue inside Israel. Leonard Hammer is Associate Professor at Middle East Technical University, Northern Cyprus Campus. He lectures in the fields of public international law and international human rights, and has published books, articles, and chapters pertaining to these areas. He has received a number of fellowships and grants to conduct research on international law, freedom of religion and conscience, migrant workers, and holy places.